Shae Brey exchanges high-fives with teammates Tori Schickel and Whitney Jennings during pregame. 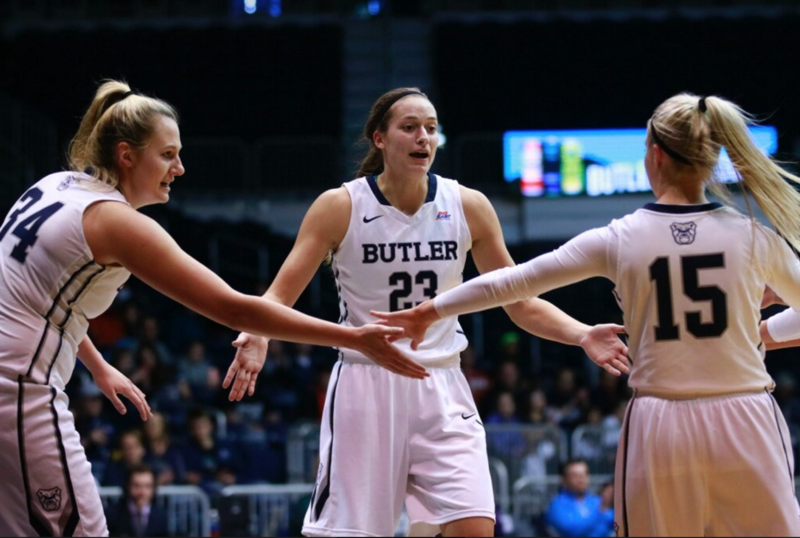 Butler is now 13-8 this season after a home win against Providence on Jan. 21. Collegian file photo. The Butler University women’s basketball team improved to 5-4 in Big East play with a 68-57 home win over Providence College on Jan. 21. Following three consecutive losses, the Bulldogs have won two in a row and stand at 13-8 on the season. Butler got off to a good start in the early stages of the game, leading Providence for nearly the entire first quarter, but a 3-pointer at the buzzer put the Friars up ten minutes into play. The Bulldogs regained the lead in the second quarter, but a 9-0 Providence scoring run to end the first half left Butler trailing by three. After converting more than 55 percent of their shots from the field in the first half, Providence was limited to just 32 percent from the field by Butler in the final 20 minutes of play. The Bulldogs outscored the Friars 16-6 in the third quarter to retake the lead. Although Providence would pull within three points in the fourth quarter, Butler was able to respond and pull away for the victory in the final minutes. Junior center Tori Schickel led Butler with a game-high 27 points, including 15 in the second half, and also tallied nine rebounds. Schickel said that limiting Providence’s leading scorer, Jovana Nogic, was key for the team in the second half. After scoring 13 points in the first half, Nogic was held scoreless by the Bulldogs in the second half. In addition to improving their defensive, head coach Kurt Godlevske said changing their offensive approach was also important. Redshirt junior guard Whitney Jennings finished with 16 points, two rebounds, and four assists. Junior guard Michelle Weaver collected all of her ten points in the second half, while sophomore forward Shae Brey tallied six points and eight rebounds. For the game, the Bulldogs outshot the Friars from the field 48 to 44 percent. Butler also out-rebounded Providence 33-23. The Bulldogs will return to action with home games Jan. 26 against Georgetown University and Jan. 28 against Villanova University.